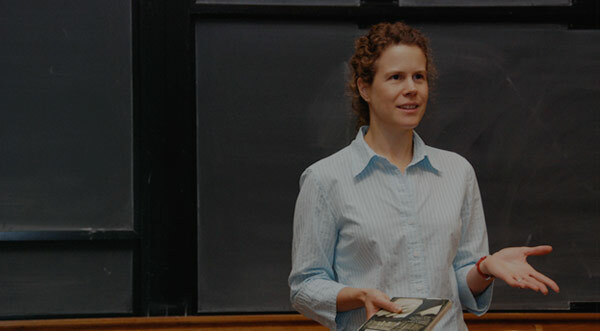 Professor Amy Hungerford’s first lecture on Flannery O’Connor’s Wise Blood addresses questions of faith and interpretation. She uses excerpts from O’Connor’s copious correspondence to introduce the critical framework of O’Connor’s Catholicism, but invites us to look beyond the question of redemption. What do characters see in this text, and what are they blind to? What do we see as readers, and how does methodology shape this vision? Professor Amy Hungerford: We finished Black Boy last time, and one of the big questions coming out of my discussion of that autobiography is: how do you manage the question of context in reading a novel or an autobiography–in reading any text? And we had a very complex publishing history to think about with that text. Flannery O’Connor’s work raises questions of a similar kind, but they look very different. And so, my lectures on Flannery O’Connor will highlight the methodologies that we can bring to any reading of a novel, and it will highlight the differences between different methodologies and what they allow us to see in a different text. Flannery O’Connor, as most of you probably know, is a Southern writer. She is very often assimilated to a whole group of southern writers who were working in the 1930s and ’40s, the “Southern Agrarians.” She was friends with a lot of the major figures of that movement, especially Allen Tate and Caroline Gordon. She lived out her life mostly in a small town called Milledgeville, Georgia. She was born in Savannah in 1925. She studied writing at the Iowa Writers Workshop. She lived in New York for a short time, but she was afflicted with lupus, a very serious illness, and she died at the age of 39 in 1964. So, she lived a pretty short life. Over the course of that life, she wrote mostly short stories, and so she is very much known for her short stories. She has a couple of novels. Of them, this is, I think, the most successful. O’Connor, you may also know, has been understood as a religious writer. She was a Catholic, and she very much made her Catholicism at the center of all the things that she said about her fictional practice. And so, we’re going to see a couple of those things today. Let’s look–just to begin with, if you brought your books–let’s look at the cover of this book. What does this cover say to you? What does this image remind you of? What does it look like to you? Do you want to answer that? Student: Is it the Sacred Heart? Wise Blood has reached the age of ten and is still alive. My critical powers are just sufficient to determine this, and I am gratified to be able to say it. The book was written with zest, and if possible it should be read that way. It is a comic novel about a Christian malgré lui, and as such very serious. For all comic novels that are any good must be about matters of life and death. Wise Blood was written by an author congenitally innocent of theory, but one with certain preoccupations. That belief in Christ is to some a matter of life and death has been a stumbling block for readers who would prefer to think it a matter of no great consequence. For them, Hazel Motes’s integrity lies in his trying with such vigor to get rid of the ragged figure who moves from tree to tree in the back of his mind. For the author, Hazel’s integrity lies in his not being able to do so. So, right up front, we are told that Hazel Motes is a Christian in spite of himself, that this is how we are to understand this character who we will come to know. I also want to give another layer to this understanding of O’Connor as a religious writer by looking at what she said in her correspondence to one of her readers who asked her some questions, and this is on the handout that I passed around. I don’t know how to cure the sourcitis, except to tell you that I can discover a good many possible sources myself for Wise Blood, but I am often embarrassed to find that I read the sources after I had written the book. I have been exposed to Wordsworth’s Intimation Ode, but that is all I can say about it. I have one of those food-chopper brains that nothing comes out of the way it went in. The Oedipus business comes nearer to home. Of course, Haze Motes is not an Oedipus figure, but there are obvious resemblances. At the time I was writing the last of the book, I was living in Connecticut [actually very close, here at Yale, and one of the people who is still at Yale, Penny Laurens–I don’t know if you’ve met her–she was married to Robert Fitzgerald, and she knew Flannery O’Connor]. When I was living in Connecticut with the Robert Fitzgeralds, Robert Fitzgerald translated the Theban Cycle with Dudley Fitz, and the translation of Oedipus Rex had just come out and I was much taken with it. Anyway, all I can say is I did a lot of thinking about Oedipus. Let me assure you that no one but a Catholic could have written Wise Blood even though it is a book about a kind of Protestant saint. It reduces Protestantism to the twin ultimate absurdities of the Church without Christ or the Holy Church of Christ without Christ, which no pious Protestant would do, and of course no unbeliever or agnostic could have written it because it is entirely redemption centered in thought. Not too many people are willing to see this, and perhaps it is hard to see, because Hazel Motes is such an admirable nihilist. His nihilism leads him back to the fact of his redemption, however, which is what he would have liked so much to get away from. When you start describing the significance of a symbol like the tunnel, which recurs in the book, you immediately begin to limit it, and a symbol should go on deepening. Everything should have a wider significance. But I am a novelist, not a critic, and I can excuse myself from explication de texte on that ground. The real reason of course is laziness. There is that characteristic self-deprecation. With letters like this–which were published copiously in a beautiful edition that Sally Fitzgerald edited–with letters like this, or her frequent essays and lectures, which are collected in a book called Mystery and Manners, she was expounding a certain reading of her fiction, even while she was still writing it. And those who were close to her have picked up that understanding of her fiction and promulgated it. And there’s a huge critical industry around Flannery O’Connor, and at the core of it is a body of criticism that finds and articulates and explains the religious meanings of her texts. With that in mind, I want to point up to the two quotations that I put on the board to start us off today: “‘I like his eyes. They don’t look like they see what he’s looking at, but they keep on looking.’” This is Sabbath Lily Hawks. And then, a character you haven’t met yet if you stopped at page 100, Onnie Jay Holy: “‘I wouldn’t have you believe nothing you can’t feel in your own hearts.’” These two quotations seem to me a kind of rubric under which we can start to think about what it means to read this novel, and what it means to read it in the light of the religious context that O’Connor herself, critics, marketers, have built up around her work. The first quotation from Sabbath Lily of course focuses on the eyes, and it is not hard to read into Haze Motes’s name that the trope of sight is going to be important. “Haze Motes.” There is that famous passage in the New Testament (or is it–oh, gosh–now I’m going to forget if it’s New or Old Testament; someone will correct me): “Do not try to remove the mote from your neighbor’s eye before you have removed it from your own,” or “lest you fail to remove the mote from your own eye.” So there is this sense of occluded sight; “Haze,” that haze. Somehow, something is wrong with Haze Motes’s eyes, something wrong with his sight, or rather there is something important about his sight that we’re going to have to unpack. But what I want to take out of Sabbath Lily’s comment about Haze is this sense of what you look at. What does Haze look at and what does he see? What do we look at when we read this novel, and what do we see? Those are questions that are going to frame the two lectures that I give on this novel. The second quotation, from Onnie Jay Holy, raises the question of sentiment. This novel–as you will soon see, once you get to the parts where Onnie Jay Holy begins to preach–this novel is very much a critique of sentimentality. If Richard Wright’s ideal response to his fiction was that, for the reader, the words would disappear, and all they would be left with is their emotional response, for O’Connor it’s precisely that kind of response–to any call: be it textual, be it an act of reading, an act of audition, hearing someone preach–that kind of response is precisely not the one you are supposed to have. And so I would ask you to think about a couple of simple questions as you move through this book, and as you think about what I have to say about it. One of them could begin with a reflection like this. Would you ever want to sit down to dinner with any of the people in this novel? I see people shaking their heads. They are quite unlikable, and this is consistent pretty much across O’Connor’s fiction: short, long, medium, whatever. Her characters are not very endearing. So you want to ask yourself why that’s so. This is a conscious decision on her part, and you want to think about that decision. When the car was ready, the man and the boy stood by to watch him drive it off. He didn’t want anybody watching him because he hadn’t driven a car in four or five years. The man and the boy didn’t say anything while he tried to start it. They only stood there looking in at him. “I wanted this car mostly to be a house for me,” he said to the man. “I ain’t got any place to be.” “You ain’t took the brake off yet,” the man said. He took the brake off and the car shot backwards because the man had left it in reverse. In a second he got it going forward and drove off crookedly past the man and boy still standing there watching. He kept going forward, thinking nothing and sweating. He had all the time he could want to study his soul in and assure himself that it was not there. When he was thoroughly convinced, he saw that this was something he had always known. The misery he had was a longing for home. It had nothing to do with Jesus. When the army finally let him go, he was pleased to think that he was still uncorrupted. All he wanted was to get back to Eastrod, Tennessee. The black Bible and his mother’s glasses were still in the bottom of his duffle bag. He didn’t read any book now, but he kept the Bible because it had come from home. He kept the glasses in case his vision should ever become dim. O’Connor has already put in place in the novel through that little passage the sense that the longing for home and the longing for redemption–or the resistance to redemption–these things are very close to one another. You can mistake–here we find out about Haze–you can mistake the longing for Jesus for the longing for home, or vice versa: the longing for home, for the longing of Jesus. The Bible that he carries around is important to him because it comes from home. I want to suggest to you that the fact that it’s the religious book for him, for his culture, for his family, is not of course incidental to the fact that it’s what reminds him of home. It’s not just that you can mistake the longing for home for the longing for Jesus. You can in some ways see religion and home as conflated. And this gets to a traditional Christian notion of the believer as not being at home in the world: that the believer somehow belongs to God’s kingdom, and that this is either countercultural–at odds with the general world in which he or she would find herself–or it is totally incompatible with the world in which we live. The Bible is a physical manifestation of the proximity of the spiritual and the material in this world. So what makes him feel close to home, in a way, has to make him feel close to the religion he’s trying to reject. That conflation is part of what makes it impossible for Haze to escape the question of redemption, even if he wants to answer it in a way that’s at odds with how, for example, his grandfather, the preacher, would answer it. This is why he’s continually mistaken for a preacher, no matter what he does. Remember he goes in to the prostitute’s house, Mrs. Watts’s, and he’s got a hat on, and the hat just makes him look like a preacher. There’s nothing he can do. He says, “I’m not a preacher,” and she says, “That’s okay if you’re not a preacher.” It’s just something that’s in his body; it’s physical. So the car–going back to the passage that I was talking about before with the Essex–the car (even though religion is not mentioned directly right here), the sense of home that it embodies, carries with it all that sense of unhousedness. And, because it’s a moving house, it carries the sense of the wandering believer with it as well. And you get that reinforced on the very next page (if you just skip over about a page from there): “A black pickup truck turned off a side road in front of him. On the back of it, an iron bed and a chair and table were tied, and on top of them a crate of Barred Rock chickens.” So other cars on the road looked like houses, mobile houses, as well. It’s not just Haze’s Essex that is imagined as home. The highway was ragged with filling stations and trailer camps and roadhouses. After a while, there were stretches where red gullies dropped off on either side of the road, and behind them there were patches of field buttoned together with 666 posts. The sky leaked all over all of it, and then it began to leak in to the car. The head of a string of pigs appeared, snout-up, over the ditch, and he had to screech to a stop and watch the rear of the last pig disappear shaking into the ditch on the other side. He started the car again and went on. He had the feeling that everything he saw was a broken-off piece of some giant blank thing he had forgotten had happened to him. So what do we notice about this landscape? First of all, it’s very much constructed. It’s buttoned together with posts, as if someone had built it, and–what’s more–these are described as 666 posts. I think this is probably a size of lumber, but you can’t get away from the mythology of that number. In the Book of Revelation it’s the number of the beast; it’s the number of the devil. It’s also a landscape that is full of pigs, wandering pigs, so if the people are wandering through this road, the pigs are equally wanderers throughout these fields. They’re unconfined; they seem to cross the road at will. The sky, the world above, is really bound up with the world below. There is very little separation, even if there is a sense that the sky is impinging on the earth and not the other way around. “The sky leaked over all of it.” It’s really, in a sense, the physical image is of rain; it’s raining, so it’s leaking all over it. But there’s more than that. There is this sense of the concerns of the sky somehow, the concerns of the above; the concerns of the transcendent are seeping their way in to the concerns of the material world below. And then you get that sort of lyrical moment of interpretation: “He had the feeling that everything he saw was a broken-off piece of some giant blank thing he had forgotten had happened to him.” Now this is where the omniscient narrator comes in quite forcefully, and gives us something to work on as we analyze Haze and we think about who he is as a character and where he finds himself. …that looked like scaffolding and depth on depth behind it were thousands of stars that all seemed to be moving very slowly, as if they were about some vast construction work that involved the whole order of the universe and would take all time to complete. No one was paying any attention to the sky. Here that omniscient narrator, as when that narrator looks in to Haze’s mind, offers you a reading of the sky and its separation from the minds of the characters that suggests, or makes you look for, kinds of structure. Here, it’s the construction work; she actually uses that word. But you get scaffolding; you get depth or perspective: counting thousands of stars, “moving…as if they were about some vast work that involved the whole order of the universe.” It vaults the very concrete materiality, the physicality, of these characters and their circumstances. It vaults that discussion into a much larger, metaphysical, transcendent context, the whole order of the universe. The train was racing through treetops that fell away at intervals and showed the sun standing very red on the edge of the farthest woods. Near the plowed fields curved and faded, and the few hogs nosing in the furrows looked like large spotted stones. Mrs. Wally B. Hitchcock, who was facing Motes in the section, said that she thought the early evening like this was the prettiest time of day, and she asked him if he didn’t think so too. “Pretty” is not exactly the word that comes to mind–at least not to my mind–when I read this. It’s more like “heavy” or “saturated,” and there’s again pigs running around. Again there is a biblical iconography behind this. There are two instances that come to my mind. When demons are cast out by the apostles and sent into a herd of pigs, and the pigs go running off a cliff and die; that’s one image. Another is the admonition not to throw your pearls before swine, not to preach to those who can’t hear, or won’t be perceptive. So these moments of landscape description offer up that consistently Christian-inflected theory of the universe, that sense of transcendence as structure, as something that’s moving inexorably, that will take all time to complete. It has a project; it has a teleology. So, that’s present in all of these moments, but–equally present–I want to get back to this sense of blankness. There is a vagueness to this language that I think is quite calculated, and it relates, in Haze’s case, to his determination to not be converted to evil, but to nothing. When he’s in the army, he says–he decides–he can get rid of Jesus by converting not to evil, but to nothing, to believe in nothing. So what O’Connor does, is she presents a sense of the world imbued with structure and meaning, but a structure and meaning that looks essentially blank. And I think the task of the novel is to fill that structure in. He was looking at the sign, and he didn’t hear the horn. An oil truck as long as a railroad car was behind him. In a second, a red, square face was at his car window. It watched the back of his neck and hat for a minute, and then a hand came in and sat on his shoulder. The driver’s expression and his hand stayed exactly the way they were, as if he didn’t hear very well. Okay, and so on and so on. Poor Enoch! Does Haze care? Now; not at all. “Haze looked straight ahead, with his face set.” Poor Enoch. Nothing can penetrate Haze’s imperviousness to other human beings. If Haze is busy looking at something, what he’s looking at is manifestly not the person in front of him. He can’t hear major elements of the soundscape: the truck horn behind him. He can’t hear his own horn, whether it blows or not. He can’t hear the voices of other people. What he sees is a mystery. As Sabbath Lily says, “his eyes, they don’t look like they see what he’s looking at.” What is he looking at, then? I think we’re meant to understand that he is so focused on the question of redemption that he fails to see anything else; he fails to see anyone else in his preoccupation with that problem. Going around the corner, he ran in to something heavy and pink. It gasped and muttered, “Clumsy.” It was Mrs. Hitchcock in a pink wrapper with her hair in knots around her head. She looked at him with her eyes squinted nearly shut. The knobs framed her face like dark toadstools. She tried to get past him, and he tried to let her, but they were both moving the same way each time. Her face became purplish except for little, white marks over it that didn’t heat up. It’s that she’s rotting; there is mushrooms growing on her, figurative mushrooms growing on her head. Her face is purple except for the white marks. The white marks are little scars, acne scars perhaps. She is a sort of mass of flesh. As Mrs. Watts, that pink wrapper–actually two pink wrappers, too tight on their bodies–suggest the excess of their corporeality, they’re big hunks of flesh. Haze hesitated and saw the hand jerk again [the hand of the steward]. He lurched up the aisle, falling against two tables on the way and getting his hand wet in somebody’s coffee. The steward placed him with three youngish women dressed like parrots. Their hands were resting on the table, red speared at the tips. He sat and looked in front of him–[I’m skipping down a little bit], glum and intense, at the neck of the woman across from him. At intervals her hand holding the cigarette would pass the spot on her neck. It would go out of his sight, and then it would pass again going back down to the table. What do we make of these odd moments of description? Why all these body parts hanging around? Why this sense of disgusting, excessive body matter? It’s often women who appear in this guise, but it’s not always women. What I want to suggest to you is that, when we actually look at the sentences on the page, when we look at the words that O’Connor chose in the moments of the narration, we see something that becomes more complicated than the “Flannery O’Connor is a Catholic writer”; “Haze Motes is a Christian malgré lui.” That’s a kind of focus. If we think about this, analogize it to how Haze looks, it’s a way of looking at O’Connor’s fiction that sees nothing but the theology behind it, that sees nothing but the Christian iconography. And I want to ask: what is it that we don’t see, when that’s all we see? What do we miss? I’ve begun to point out a few things that I think we miss: the fragmentation of bodies. Why are bodies consistently fragmented–not just here–everywhere in O’Connor’s fiction? People are always losing a wooden leg and having parts of their limbs fall off. It’s very hard to keep a body together in O’Connor, hard to keep body and soul…well, I won’t get in to that. So why is that? What kind of methodology for reading would allow us to have something to say about that? Is it something we need to have something to say about? Is it in the same register of importance in our reading as some of these more theological, structural considerations that have been offered to us in her letters, in her preface, and in the very overt symbology of the landscape scenes, of these other scenes that I was reading to you today, in that image of the unhoused believer trying to find a home in an alien world? So, in my next lecture, what I’m going to do is pretty much contradict most of what I said today. I’m going to set aside theology as the lens through which I read. And, if you felt you were convinced by my reading of that iconography in these passages, then you want to think about why that’s convincing. You want to think about how much attention and primacy we should give to an author’s statements about what her work mean–as readers. Maybe you want to say, “You can’t argue with that; we have to accept that. That’s really what the writer intends to say, and that’s what we should see, and that’s what we should strive to understand.” Well, I’m going to offer you two different ways–actually more like three different ways–to look at the novel in the second lecture. So, finish the novel for next Wednesday, and we will go from there.